In the summer months, you'll rarely find me drinking a cocktail that's something other than rosé or sparkling rosé. It's just so refreshing and hits the spot on a warm, sunny day. But sometimes rosé with a twist is a fun way to switch things up a bit while still enjoying my favorite wine. The recipe combines the elements of a frozé with that of a granita for a truly refreshing and tasty cocktail that's surprisingly easy to prepare. 1. Spoon a scoop of sorbet into the bottom of a chilled glass and top with a tablespoon or so of the watermelon cubes. 2. 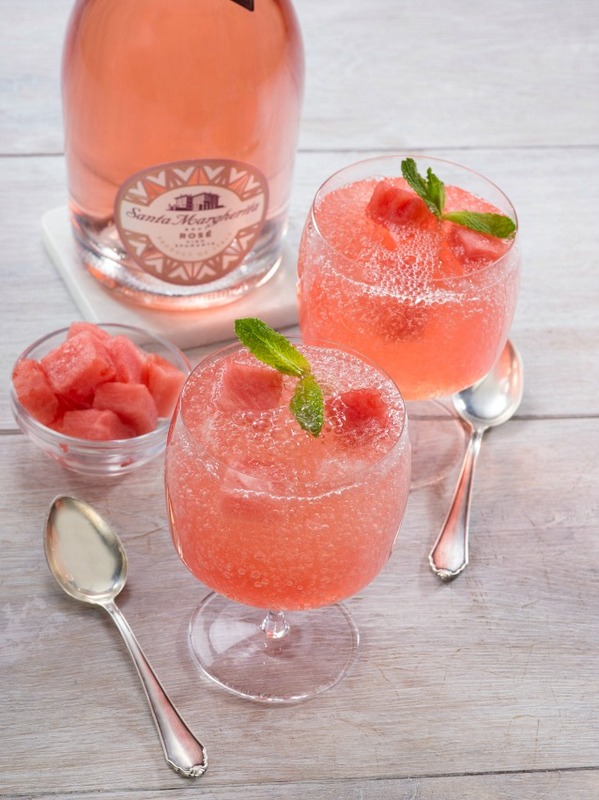 Pour the Santa Margherita Sparkling Rosé over the sorbet and melon. 4. Serve immediately with a silver spoon. **OPTION Purchase sorbet from a gourmet market instead of making your own. In a small saucepan bring the sugar, water, and rosemary to a boil. Remove it from the heat and let it cool to room temperature, then strain. Combine the rosemary syrup, watermelon, lime juice, and tequila in a blender and process until smooth. Strain through a fine-mesh sieve and refrigerate overnight. Freeze the sorbet "granita-style" by putting it in the freezer and stirring every hour for five hours. Recipe appears courtesy of Santa Margherita wines.